There are many versions of this epic dish. This is the Kashmiri Pandit version and came to me via Dr Rana, who I met on my trip to Kashmir. Rinse the lamb shoulder in stock pot of hot water. Drain completely. Boil the ratan jot or mawaal in 2 cups of water until reduce to 1/2 cup. Drain and reserve colored liquid. Heat oil and ghee on a medium flame. Add all the whole spices and cook until fragrant about 1 minutes. Then add asafetida. Add the lamb or mutton pieces and cook on high heat to sear the meat. Using tongs remove the meat and set aside on a plate. Add yogurt, aniseed powder, red chilli and yogurt. Stir well and cook on a medium flame until the yogurt splits, then comes together and releases its oil on the sides. Return the meat to the yogurt mixture. Add the color and a teaspoon of salt. If the color is not red enough add more. Toss well and cook on a slow flame until meat is tender. Add more water a little at a time during the cooking process. This is eaten with rice so you must have gravy. Add more red chilli and salt as per your taste. On a trip to Srinagar last year I finally learned what goes into a Kashmiri Rogan Josh. And was I surprised. No dish has bewildered me as much. It is one of India's most famous curries, but also offered in so many hodgepodge and wildly disparate versions in restaurants and online that it’s hard to know what an authentic Rogan Josh is. Maybe that shouldn't be surprising - with the violence in Kashmir (In the few days I was there a man with a grenade was arrested at the airport and, there was a shooting at a hotel and a gunfight between militants and the armed forces), there is a lot less 'sharing' of Kashmiri culture in the mainstream than there should be. Kashmiri cooking traces its history to the 15th century, when Timur the Lame invaded India and accomplished woodcarvers, painters, weavers, architects and calligraphers and cooks migrated from Samarkand in today’s Uzbekistan, to the Kashmir valley. So too did expert cooks, known as Wazas. 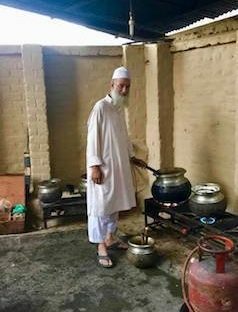 The descendants of these cooks are now the master chefs of Kashmir and the elaborate feasts they prepare on special occasions came to be called Wazwaan. I had the good fortune to talk with Ghulam Mohammed Bhandari Waza, a renowned chef in Srinagar, with the assistance of his friend Arif Shah. Ghulam Mohammed's father and grandfather were also Wazas, but unhappily his son doesn't want to be one. Arif translated our conversations from Koshur to English and added that the younger generation don’t think the profession is given the respect it’s due. So many Kashmiri traditions, like the weavers of epic jamawar shawls, the wood workers of Khatamband, Ferozi and Pinjra kari and the makers of Wagu mats, have given up their trades as the years of violence in the valley have chased away tourists and with them demand for artisanal crafts. It is crucial these authentic recipes are preserved and as I was lucky enough to get many of them including Dum Aloo and Gucchi Pulao I hope you will consider cooking them up. Kashmir is a syncretic culture with myriad influences beginning with the trickle effects of the Persian Achaemenid invasions, followed by Alexander the Great's invasion of Punjab, the arrival of Turkish scholars, the Central Asians, those who ruled after Babur came to be called the Mughals, Kashmiri food is complex and beautiful and like its culture and crafts, an alloy welded by some of the world’s greatest warriors and civilizations. 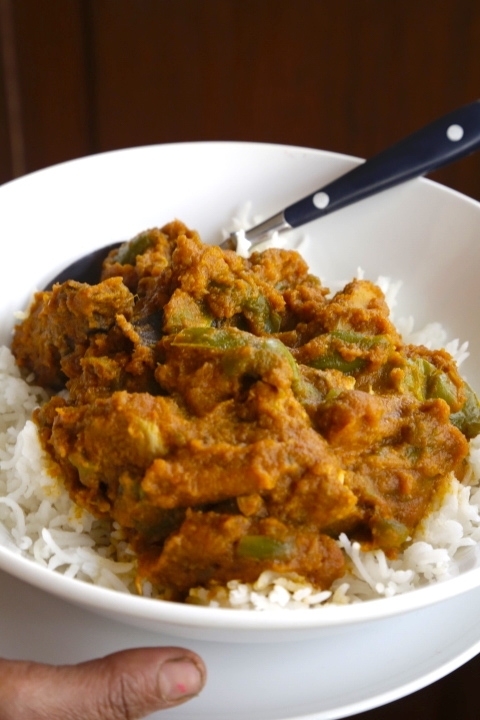 While the name Rogan Josh is Persian, the techniques and ingredients involved are diverse. Roughan means "oil" in Persian, while josh means to boil. Interestingly the Muslim version of this dish involves boiling, while the Kashmiri Pandit (the Hindu Shaivites of Kashmir) recipe involves searing and braising. There is undoubtedly an Indian influence in the use of ghee and a large number of spices. Some of the ingredients such as Alkanet are of Mediterranean origin, Mawal or Cockscombe flower, it is argued is of African origin. 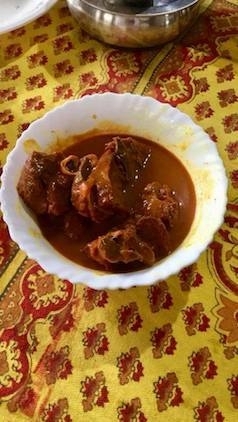 • There are 2 versions of Rogan Josh The Hindu Kashmiri Pandit version, which is more easily found on the internet and the Muslim version, which I obtained from Ghulam Waza. You will be surprised how different the two are and even more how awful the fake versions served in restaurants are. • Rogan Josh is also made with chicken. You will find a good recipe for it in a book called Wazwaan by Khan Mohammed Sharief Waza and his brothers. • The Pandit version does not use garlic and onions while the Muslim version uses Kashmir pearl garlic and shallots called pran (see grocery list below). • The Pandit version uses dried ginger powder called sunth. • The Pandit version uses yogurt the Muslim version doesn't. • The ideal meat is mutton and if unavailable lamb. The best and traditional cut is the shoulder for the Kashmiri Pandit version. The Muslim version often uses meaty goat ribs also called champh. • Several natural colouring agents unique to Kashmir are employed. Mawal or red cockscomb flower in the Wazwaan version, and rattan jot, a kind of wooden peel known as alkanet root or Alkanna tinctoria in the Pandit preparation. Saffron is used in the Muslim version and alters the taste because saffron unlike Mawal and Rattanjot has a strong flavour. • Tomato is incorrectly used as a substitute when Mawal and Rattanjot are not available. No authentic version of Rogan Josh I ate or saw being cooked in Kashmir has tomatoes. Kashmiri chilli is also added in excess sometimes to produce a red color. This is incorrect because Rogan Josh is not a burn your tongue off dish. If neither are available to you I would suggest you use beet color as you might for a red velvet cake. • In a Wazwaan the traditional Muslim meal, it is always the Muslim version of Rogan Josh with onions and garlic that is served. • The Hindu version uses aniseed and asafetida or hing to replace garlic. • The Muslim version uses ghee, the Hindu version also uses ghee and sometimes mustard oil. • Both use dried Kashmiri chillies. • Rogan Josh is served with rice. Much of Kashmiri cooking relies on a fragrant mutton stock. I was surprised to note that Dum Aloo and Gucchi Pulao are prepared with mutton stock. The Dum Aloo served by restaurants is a far cry from the version made by Waza Ghulam and the technique for Gucchi Pulao is completely different from anything I’ve eaten before. Unlike the Kashmiri Pandits, the Waza's donot employ the technique of 'tadka' or tempering (throwing whole spices into hot oil) as much. A critical difference. Ghulam Waza was quick to point out that in the old days Gucchi pulao was never a part of a Wazwaan. But many people insist on it now because Gucchi, a variety of Kashmiri morels are exorbitantly expensive and including them on a menu is a status symbol. A full Wazwaan can have as many as 25 courses but in 2017 the J&K government limited the numbers of courses to 7, banned the use of fire crackers and loudspeakers on account of air and sound pollution at weddings and the purchase of dry fruits sweets to be distributed with wedding cards to curtail the huge quantities food at weddings that wound up in dustbins. Enjoy the Rogan Josh recipe. Dum Aloo, Gucchi Pulao and the Kashmiri Pandit version of Rogan Josh to follow soon. • Ratanjot- If you buy Alkanet check on the expiry date. In humid weather it goes bad quickly and loses color. Mawal of dried cockscombe flower comes in large quantities. You maybe better off buying the concentrated powder. If unavailable use beet powder. • A Kashmiri saffron I have enjoyed using for various reasons including that it is Mogra (taken from the stamen) and of single origin- many Kashmiri saffron are blended with Iranian saffron. • There are several kinds of Kashmiri garlic. The version in this recipe is single clove mountain garlic which is much more potent then regular garlic. If you don't have access use twice the quantity of regular garlic cloves. • Kashmiri shallots can also be used in French cuisine quite satisfactorily. Keep them dry and refrigerated. In my experience a humid climate has a detrimental effect on them. Heat 1 liter water on the fire and boil the mawal flowers until you have a bright red color and the water is down to 1/2 cup of liquid. Drain and reserve this liquid. Put 1 Kg mutton or ribs (champh) in 2 liters of room temperature water and boil it on a low flame for 5 minutes. Strain the mutton out and discard the remaining water. This helps to soften and clean the mutton. Put 2 litres of water and the strained mutton into the same stock pot with the garlic, black and green cardamom, cloves, cinnamon and 1 teaspoon salt. Boil this for 30 mins on a high flame. Do not steam the mutton or use a pressure cooker, it has to be boiled on high heat with a loose lid over the vessel. Strain out the mutton pieces from the stock and filter entire stock through a piece of muslin cloth known as peera cloth in Kashmiri or use a fine steel strainer. Reserve the ribs or meat pieces on a plate and discard all the spices. Heat oil in a skillet on medium flame and saute the pran or shallots in ghee until deep golden and soft. Use a little mutton stock and grind these onions to a smooth paste. Boil the red chillies in 1 cup of water until water is mostly evaporated. Drain and grind chillies to a smooth paste. Add the chilli and pran paste to the stock. Add 1/2 teaspoon turmeric and the mawal liquid concentrate. Return ribs to stock and cook on a medium flame without a lid until stock begins to thicken. Just before serving sprinkle with a little ground cardamom. 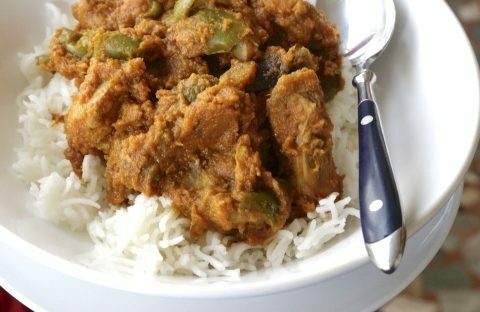 THERE ARE MANY VERSIONS OF CHICKEN KADAI. THIS ONE IS EASY AND HAS A WARM COMFORTING FLAVOR. ON A COLD DAY IN NYC THIS WAS A GREAT DISH TO EAT FOR DINNER. MAKE AN EXTRA LARGE BATCH AND USE PANEER FOR VEGETARIANS, TOFU FOR VEGANS. PUREE ONIONS, GARLIC, CUMIN POWDER, TURMERIC AND CAYENNE AND 1 TSP SALT TO A SMOOTH PASTE. HEAT OIL IN A LARGE, DEEP SKILLET. ADD ALL THE WHOLE SPICES AND COOK ONE MINUTE UNTIL FRAGRANT. ADD TOMATO ONION PASTE AND COOK DOWN ON A SLOW TO MEDIUM FLAME UNTIL REDUCED TO HALF ITS VOLUME. YOU CAN COVER THE COOKING POT WITH A LID LEAVING IT A LITTLE OPEN TO ALLOW STEAM TO ESCAPE. AS THE MIXTURE COOKS IT MAY BUBBLE AND SPIT. STIR FROM TIME TO TIME. ADD GARLIC AND GINGER AND THEN CAPSICUM AND COARSELY CUT ONION AND CONTINUE TO COOK ANOTHER 25 MINUTES UNTIL MIXTURE IS VERY DRY AND OIL BEGINS TO LEAVE THE SIDES. ADD CHICKEN AND RAISE FLAME TO HIGH. TOSS CHICKEN IN MASALA TO SEAL THE JUICES. THEN REDUCE FLAME. ADD ONE CUP OF WATER AND COOK CHICKEN ON A VERY SLOW FLAME UNTIL TENDER. YOU CAN ALSO PRESSURE COOKER THE CHICKEN FOR ONE WHISTLE. IF USING PANEER OR TOFU COMPLETE MAKING THE GRAVY BEFORE YOU ADD THE PANEER OR TOFU AS IT DOESN'T NEED MUCH COOKING. ADD MORE WATER TO GET A GRAVY THE CONSISTENCY YOU PREFER. IF YOU PLAN TO EAT IT WITH RICE YOU WILL NEED MORE WATER, FOR ROTIS A DRIER GRAVY.